DKN AM-E Exercise Bike Review - is it Worth the Money? DKN AM-E Exercise Bike Review – Worth the Money? DKN Technology came out with the AM-E exercise bike and it blew us out of the water. Not only is this bike rated very highly, but it features a sleek design and all of the features you could want in an exercise bike – even a heart rate monitor. I was happy when unpacking the box to see that setup was not going to be an issue. The instructions were lacking as they are in picture format, but everything is rather self-explanatory. The machine comes mostly pre-assembled. It’s just a matter of attaching bolts to get the column, console, and front and rear feet in place. Most people can assemble the bike in less than 60 minutes. Once assembled, it was well worth the effort. The legs adjust at the back of the machine to ensure that it sits flat on the floor and doesn’t rock from side to side while being used. The seat may need a little adjusting, which is easy enough thanks to the ability to adjust it horizontally and vertically. Tall and smaller users will have no issue on this bike. The saddle itself is well padded, so you won’t feel any aches or discomfort when riding. The low frame makes it easy for just about any user to get on and off the bike. An ergonomic handlebar allows you to monitor your pulse as long as you have your hands on the silver grips. Overall, the handlebars were extremely comfortable and no slipping was seen even when my palms were sweaty. The angle of the handlebars can also be adjusted to suit your riding style. Final adjustments needed to be made to the pedals to ensure that the strap was wide enough for my feet. This was a simple adjustment. All of the adjustable features can be altered with the twist of a knob. The adjustability features alone make this bike a good buy, as it can accommodate users of most heights and sizes. Finally, jumping on the bike for the first time provided an immense workout. The saddle and handlebars were near perfect and the pedals gripped my feet so that no slipping was experienced. Whether you’re just getting started with an exercise routine or you’re already at a higher fitness level, the AM-E can help you reach your goals. With 32 resistance levels, this bike offers a variety of intensity so that you can exercise at your desired level. If you’re trying to lose weight or build stamina, these two metrics are essential. The pre-set workouts are very demanding and will challenge even the fittest rider. With the ability to add resistance at will, you’ll find that this bike can provide both a stamina and muscle building workout right at home. Each programme is depicted (in graph form to display the resistance level) underneath the main screen. The illuminated control buttons at the bottom of the console make it easy to select your workout. The handlebars pulse grip sensors help you track your heart rate, and the built-in wireless receiver makes this bike compatible with chest strap pulse monitors (sold separately). Once you have finished your workout the AM-E is easy to put away thanks to the two transport wheels located on the front of the machine. The bike weighs 34.5kg which sounds heavy but is easy to move with help from the wheels. DKN is known for its quality equipment, and the AM-E model is no exception. Durable and stable, this model can accommodate users up to 140kg. The 8 kg flywheel keeps the bike smooth and quiet while in use while also helping to generate plenty of resistance. It was a challenge to find complaints about this bike. One thing you might notice is that the calorie tracker is a bit off. Take the reading with a grain of salt. 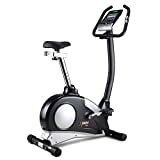 Not only is this machine extremely comfortable, but it comes with an amazing on-board display that allows for complete control over the way you exercise. The cool down option is also a nice addition and will allow you to get your heart rate to drop before jumping off the bike. This is the exercise bike you want if you want a gym-level workout in the comfort of your own home. Quiet, sturdy and capable, the AM-E can compete with many of the bikes found in gyms and sports clubs.